It is very important that the water temperature be consistent. Rapid fluctuations in temperature, particularly lower temperatures, causes physical stress to fish that often leads to other diseases. The solution to maintaining the correct water temperature is an aquarium heater and thermostat. 1) It’s very good to keep the temperature below 28°c, with the lowest temperature we can go to being about 22°c, depending on the species of fishes. The lower the temperature, the healthier the plants will be. The low temperature will not affect the growth of plants or shrimp but we must take few hours for fishes to get used to the temperature before we release it completely into the tank. 1) An external fan can be attached to the tank to reduce the temperature. This need depends on the lighting in the aquarium as the light used can increase the temperature in the system. 2) It’s not recommended to switch on and off the air-conditioning, which will affect the temperature in the tank. This will cause the fishes to get sick very easily. If the tank is place in an air-conditioned room, an external fan is a must when the air-conditioning is turned off. 3) Use rod-shaped combined heater-stats, which is placed inside the tank. This is very common these days. These are available in a number of standard wattages between 25W and 300W. 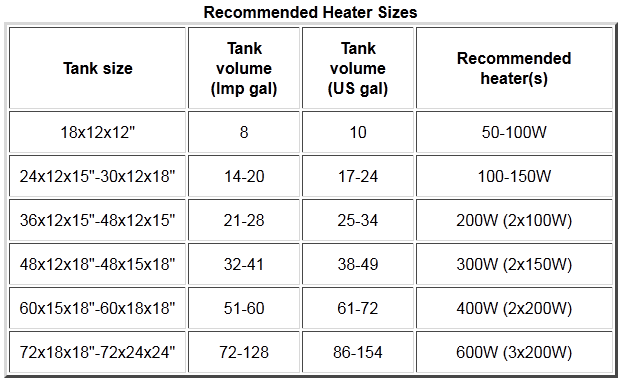 The table below gives examples of recommended heater wattages for various tank sizes. The modern combined heater-stats use very reliable thermocouples to maintain a stable temperature. 4) External thermostats (the thermostat regulates the heater, turning it on and off to maintain the desired temperature) can also be used to control heating elements placed in the tank, and have the advantage of a less bulky element inside the tank.